Following the German occupation of Yugoslavia in 1941, the the country was partitioned and a quisling fascist state in Serbia was established under General Milan Nedic. In May 1941, a large part of Kosovo, with a population of some 820,000 Serbs, Montenegrins, Roma, Jews and Albanians was detached from Serbia and given to the Axis state of Albania, whose leaders had been installed by Mussolini's fascist regime in Italy. Albania was one of the first countries in Europe to have a puppet fascist regime established - in this case by when Mussolini ordered Italian troops to invade and occupy the country. This forced the Albanian ruler King Zog I, to flee to Greece on April 7th, 1939, and Italy then formally annexed the country and established a military government and viceroy. The Italian fascists then began a programme to colonize the country when thousands of settlers emigrated to Albania. 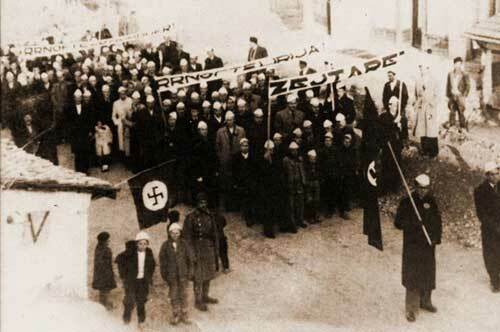 An Albanian Fascist Party was established with Albanian Black skirts based on Italian models. Albania thus became an Axis power - sending it troops to fight alongside Italy when Greece was invaded in 1941. With support of the Grand Mufti of Jerusalem, Haj Amin El Husseini and Bedri Pejani, the Muslim leader of the Albanian National committee, a call was made for a union of the new Greater Albania with Bosnia and Herzegovina and the Sandzak region of Serbia, into a Islamic state. The Germans, whilst sympathetic to idea, rejected the plan. Played an important role in collaborating with the occupation forces, who were able to present themselves as liberators of the Albanians and creators of a unified Albania (p 122). These Albanian collaborators participated in the forced deportation of thousands of Slavs, many of whom were sent to forced labour camps. In scenes similar to those in 1999 and 2000, many thousands more were killed and scores of villages were burnt down and their occupants (an estimated 10,000) were expelled. The Italian occupation forces encouraged an extensive settlement of up to 72,000 Albanians from Albania to Kosovo, according to Vickers (p123). Who was Skanderbeg the legendary hero of Albania who the SS named a division after ? A Christian by birth, George Kastrioti Skanderbeg (1405-1468), was given as a hostage to the Ottoman Sultan Murat II to be brought up as a Muslim at Adrianople (Edrine) when he was a child. He became an officer in the Ottoman Turkish army and led them in many victories over European armies. The Sultan was impressed with him that he gave him the title Iskander Bey in Turkish, from "Iskander", (Aleksander the Great, or prince Aleksander), and "Bey", Master. The name was shortened to Skanderbeg, beg being the local variant of bey. Later Kastrioti renounced Islam and converted back to Christianity. Soon afterwards, he led a revolt against the Ottomans in 1442. Sultan Mohammed II sent Turkish armies to quell the uprising, but they were unable initially to put down the Albanian revolt. However, after Kastrioti died in 1468 the Turks soon occupied Albania and finally established control over the territory. Albania would remain part of the Ottoman Empire until 1912, when it finally won independence. On September 3rd, 1943, when Italy capitulated the German were forced to occupy Albania. They sent in the 100th Jaeger Division from Greece and the 297th Infantry Division from Serbia and the German 1st Mountain Division to occupy Albania, including Kosovo. These troops were organized into the XXI Mountain Corps which was under the command of General Paul Bader. However, the German's realised that additional security forces for Kosovo were needed, as Germans troops would be need for for defense of Albania's coastline. Thus, the decision was made to form Albanian Skanderbeg division for this purpose. Acting upon instructions of the SS war criminal Henrich Himmler, the SS ordered the formation of the Albanian Skanderbeg SS Division on April 17th, 1944. The SS Command in Albania, in conduction with the Albanian National Committee, found some 11,398 possible recruits for the Skanderbeg SS division - most of whom were from Albanian gendarmes, special police and para-military units in Kosovo that were under the direct control of the Albanian Interior Minister Xhafer Deva. The official German designation for the division was 21 Waffen Gebirgs Division der SS "Skanderbeg" (Albanische Nr 1). The Albanians in the Skanderbeg Division were mostly Muslims, of the Bektashi and Sunni sects of Islam. The division however, contained several hundred Albanian Catholics, followers of Jon Marko Joni. The SS designed a distinctive arm patch for the division, consisting of a black double-headed eagle on a red background, the national symbol of Albania. The word "Skanderbeg", embroidered in white, appeared above the eagle and was worn on the left sleeve. The right collar patch consisted of a helmet with a goat's head on top, the helmet supposedly worn by Skanderbeg. They were helped by the newly formed Albanian Nazi party, known as the Balli Kombetar (BK) which has been established through the efforts of Ernst Kaltenbrunner (later executed as a war criminal after the war). Like with the KLA (Kosovo Liberation Army) today, they wanted the establishment of a Greater Albanian state within the 1941 borders (including Kosovo) set up by the Axis powers. Many of its leaders and supporters were drawn from rich landowners in Albania, who saw fascism as a political system that would protect their privileges in a "unified" Albania. According to Vickers, the Skanderbeg division - which was stationed and operated in Kosovo, Serbia and Montenegro - "indiscriminately killed Serbs and Montenegrins" in Kosovo. The actions of these Albanian quislings led to the departure of another estimated 10,000 Slavs from the province. Altogether it is estimated that at least 50-60,000 Slavs were expelled from Kosovo during the Second World War. This however, does not excuse the terror unleashed by the Yugoslav state both in 1945 under Tito and later in the 1990's under under Milosevic, when, thousands of Albanian civilians were either murdered, or their houses burnt down or were expelled from Kosovo. Like in 1945, many who remained were subjected to gross violations of human rights including unfair trials, torture and extra-judicial executions. In June 1944, the Skanderbeg SS Division was based in Montenegro, whilst other parts of the division were based in the Kosovo towns of Pristina, Pec, Jakova and Prizren. The first major action of the division occurred in August, 1944 in Kosovo, and in September, the Skanderbeg SS Division occupied part of Macedonia, and helped to garrison the capital Skopje. It was also active in the southern part of the puppet state of Serbia. Although some 6,500 Albanian volunteers had come forward to join the SS Saknderbeg division, by October 1944 desertions were rife: Over two-thirds of the volunteers were declared unfit for military service and the Division suffered some 3,500 desertions within its first two months of operation. The high desertion rate resulted in the unit being disbanded and reformed with the German SS officers forming Kampfgruppe "Skanderbeg" which joined up with the SS "Prinz Eugen" regiment in Yugoslavia. This battle group was was in action in December 1944/January 1945 around Zwornik, Bjellina and Brcko. On 30th January 1945, a small number of Germans and Albanians from this unit were transferred to 32nd SS-Panzer grenadier-Division on 30th January 1945 and sent to the Oder front in 1945. German forces had fled Kosovo by November 1944, leaving the BK (then numbering some 9,000 members) to fend for itself. Albanian fascists continued to resist partisans representing Tito's emerging government until the spring of 1945. At the beginning of the second world war, Kosovo had a population of 550 Jews. Altogether, 210 perished in German concentration camps - the only Jews to be killed in the war in Kosovo - representing 38.18% of the Jewish population. This compares with Belgrade, were only 1,115 survived the war out of almost 12,000 (9%), and Croatia, where an estimated 25% of the Jewish population survived. Thus, you were more likely to survive the war if you were Jewish and lived in Albania or Kosovo rather than Belgrade or Croatia. However, this is not to say that it was any easier for Jews, Roma or Slavs - the three national groups designated by the Nazi's as "subhuman races", and top of their list for extermination or deportation by the Nazis or their quislings in Croatia, Serbia and Kosovo. In fact, one of the first acts of the SS Skanderbeg division in April 1944 was the arresting of 281 Jews in Pristina, and "510 Jews, Communists, Partisans and individual suspects". According to Bernard J. Fischer, writing in Albania at War, 1939-1945 (Purdue University Press, West Lafayette, Indians, USA, 1999, p. 187). All 281 Jews were deported to Germany - probably to Bergen-Belsen death camp. However, the German occupation authorities allowed Albania an unusual degree of autonomy and, for the most part, refrained from deporting and/or murdering the majority of Albanian Jews. Most of the tiny Jewish population of "old Albania" (about 200) survived the Holocaust. The Germans, however, confiscated most Jewish-owned property in 1943-1944. Indeed, Albania is the only country occupied by Germany in which the Jewish population actually grew during the war and was larger than when the war started in 1939. There were some 1,800 Jews in Albania by war's end, mostly escapees from the Holocaust in Greece and Yugoslavia. Albanians sheltered them and were later honored by the Israel for their efforts. As the war drew to a close, Yugoslav Partisans launched a large-scale military campaign in Kosovo to consolidate their rule and the Albanians reacted with a general insurrection, that forced the new authorities to declare martial law in the region in 1945. Because of their co-operation with the Germans, the Kosovo Albanians were seen as politically unreliable and thus a possible threat to the stability and territorial integrity of the new Communist Yugoslavia. Thus, Kosovo emerged from the war in a state of siege, with its population seen as a threat rather than as an asset. Following the war, the post war population of Jews in Kosovo dwindled considerably after the war to only 35 who were registered as living in Pristina in 1989 and 41 in 1995. Most reports now suggest that Albanian extremists have driven them out since NATO drove out the Yugoslav army in 1999. The Jewish population of Yugoslavia today is estimated to be 2500 with most of them living in Belgrade. The recent conflict in Kosovo has ironically led to the exodus of the last of the remaining Jews of Kosovo - something that didn't even happen in the last war in 1941.